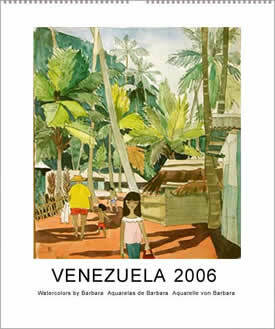 This charming watercolours for this calendar were painted by Barbara long time ago in Venezuela . Many motifs painted by Barbara do not exist nowadays. They were victim of the progress. She painted what she liked, without taking notice where she was being creative. Notice: final calendar description will follow! The calendar for 2006 is being produced. We will be able to take orders from September 2005 on. Certainly you can place an advance order or reservation. You will be informed by email, when the calendar is ready for sale.